Rosa Laevigata, Root Dry (Cherokee Rose) 1.5g. Smilax China, Rhizome Dry (China Root) 1.2g. Lygodium Japonicum, Whole Plant Dry (Japanese Climbing Fern) 832mg. For cystitis symptom relief: Take 5 tablets four times daily. Take with food or as directed by a healthcare professional. 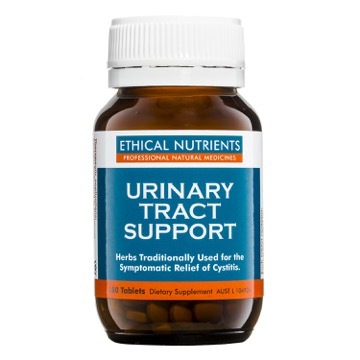 Ethical Nutrients Urinary Tract Support 180 Tablets is rated 5.0 out of 5 by 4. Rated 5 out of 5 by KH88 from Very effective. These do what they promise. Being very susceptible to UTIs I take these when I feel like one might be coming on and so far they have managed to prevent anything progressing to a full-blown infection. Good alternative to having to take antibiotics every time as well. Rated 5 out of 5 by Inge B from This product works! I would not be without this in my house as it has worked for me every time there has been an issue. Rated 5 out of 5 by Tan18 from Fantastic support Great product, very beneficial support. I would highly recommend trying these tablets. Rated 5 out of 5 by Pinky from Great I find Ethical Nutrients Urinary tract support, works great for me.